Like VW camper vans I also have a love and fascination for beach huts! Luckily with around 23,000 beach huts in the UK, I have plenty of opportunity of photographing them and maybe dreaming of owning one, one day! I recently featured some beach huts in one of my posts and from the comments received its clear I'm not alone in admiring them! At the end of the 18th century sea bathing became very fashionable. King George III while visiting Weymouth in the 1790's decided to take a dip in the waters of Weymouth Bay. At that time men and women swam in separate areas of the beach. Bathing machines were towed out to sea by horses. To preserve their modesty people would enter the machine, change their clothes and then enter the water on the other side. 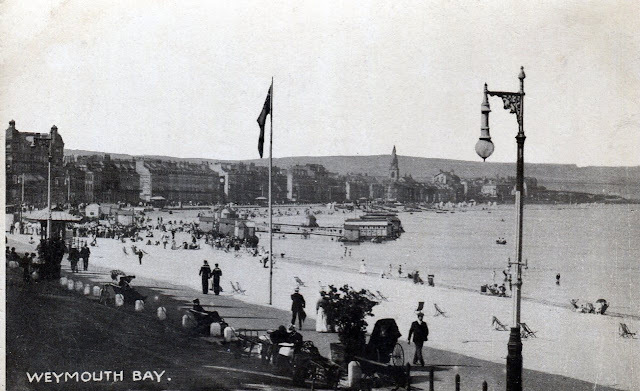 King George's dip in Weymouth Bay is still remembered in Weymouth today with his statute and a replica of the bathing machine used. As mixed bathing became acceptable these bathing machines were no longer required and many were just left abandoned on the shore. The wheels were taken off and they were transformed into the first beach huts changing on the beach was still unacceptable. As the popularity of going to the seaside grew - so did the number of beach huts . New ones were built or old buildings were converted to provide not only somewhere to change, but also to have a brew up or picnic, without the sand in the sandwiches. They also provided a shelter from the rain! The views over looking the sea are always spectacular whatever the weather! The oldest beach hut in the UK is in Bournemouth in Dorset dating back to 1909 - it is very similar to the ones above. 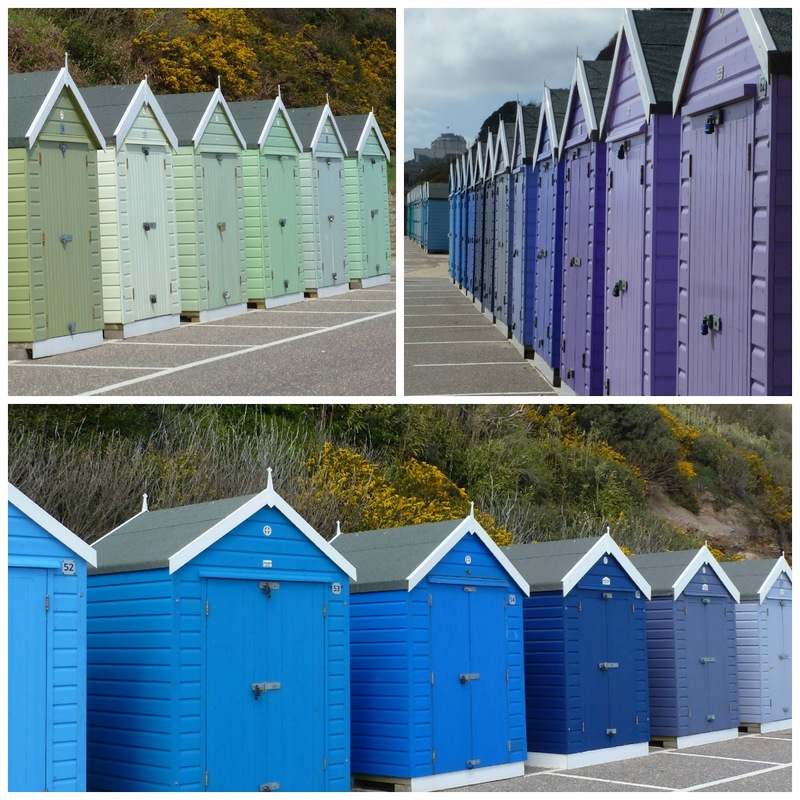 Bournemouth has over 200 beach chalets ans some of them have been painted in different shades of a single colour. I'm surprised they haven't been used in a paint advertisement. Do you like the different shades? Although some beach huts are privately owned, many are still owned by councils and are rented out on a long term basis, while others can be rented or a daily or weekly basis. I started this post about a week ago and then discovered that it has been a popular subject this week! I saw BBC's Countryfile last weekend featured the history of the beach hut and in the latest copy of Coast Magazine is a selection of beach huts where you can stay! We have extended weekend with May Day bank holiday on Monday and hopefully the weather will stay dry! Wishing you a good weekend and thank you as always for all the lovely comments you leave me. So many lovely beach huts, not many in Sydney but in Victoria they are still around. Beach huts are always so great to photograph aren't they but I haven't seen so many of them as you have I'm sure. I had never heard of a bathing machine. The octagonal shaped little house/tower on wheels is so neat! Good morning Sarah and Daisy! I LOVE THESE BEACH HUTS and you do not see them here on our beaches. I grew up on the southern coast of California, USA and we never had these. Then I lived for many years on the eastern coast of Boston, Massachusetts and no huts....but these, especially that portable one (I saw one in the movie, Mrs. Brown where Queen Victoria is driven out to the shore) are just gorgeous icons of the British coast. Remarkable tours that you take us on! I am so looking forward to your France tour for our link party! O yes me too!! Both VW Campers and Beach huts, wish we had them here but they are very rare and more of an English thing.......loved these examples! I love to see beach huts too; they are so much a part of the seaside tradition in this country. I'm always fascinated to glimpse inside and see how people have furnished their own huts. Some of the beach huts here on the east coast have sold for unbelievable amounts of money, but I've not heard of one going for anything like £245,000. Incredible! Those beach huts are adorable! I love the bright colours! I can't believe they could possibly be so expensive though- they are so tiny. Why would someone pay so much for one? Oh those colours! (and oh those prices!!) I did enjoy your post Sarah. I hope your weather is better than ours this weekend.. This is so evocative of my childhood - my parents always took one for a month every summer. We would take a little primus stove with us to make a hot drink or heat up soup - I can smell the wet sand on the floor, and visualise the buckets, spades and towels hanging on the walls. I haven't been to Eastbourne for quite a few years now and didn't have a camera as a constant companion then! My parents had one in Hove for a few years. We will look forward to seeing more of your beach hut and others in Eastbourne on your blog! Those colours are fabulous! One of my friends owns a beach hut and she and her husband spend a lot of their time there, resting and reading and walking. Lovely to have but expensive to buy as you say. what an interesting read, I enjoyed this post. The prices they fetch are amazing. What a crazy price for a beach hut Sarah!!! Hope you will get yours one day, for a lower price. Hope your husband is back home again and feeling well! I can certainly see what you mean about the paint advertisement! What a lovely post, lots of information and beautiful photos as ever. I never knew the first beach huts were bathing machines minus the wheels, really interesting! We have lots around this part of the coast, they always look so pretty in their bright colours. I'm always a little bit envious of the families sitting inside with their mugs of tea! I love these beach huts. How I would love to hire one for a day. Take a pic nick and sit and watch the sea. I am sure there must be many stories about all these lovely little huts. I do like the different colours. As a young child.. I remember going to the beach with my parents. and eating ice cream and playing with my bucket and spade. years ago Sarah. But the memory is there. What a great story about King George. How we have changed over the years. I like this post very much..its informative and your photos are stunning. I'd love a beach hut. The ones at Southwold near me go for silly money though. I always enjoy seeing pictures of these fun Beach huts and how wonderful all your photographs are - thanks for sharing. Hope that you have lovely weather for your bank holiday. I too love beach huts and VW camper vans, especially the split screen ones. I also hav to admit to being a bit of a nosey parker where beach hits are concerned - I always peek at the decor whenever the huts are open and in use - the interiors as so evocative of days gone by. All of the beach huts are fun, but I love the colorful huts the most. I think I must have commented on this before. My grandmother was from northern Norway and our relatives still in Norway have cute colorful beach houses much like those your featured. I'm amazed that people will pay that amount of money for a tiny beach hut, it's just crazy. I loved all your photos but especially the 2nd one from the bottom as I like the colours best. I love beach huts, I wouldn't get one here though as although they are relatively cheap....up to 1,000 plus ground rent, they are vandalised or set fire to and then they often get washed up by the sea! Up the road in Southwold they go for about 25,000! i can't get enough of these or your lovely photos and interesting lessons. Thank you for sharing those lovely beach houses. I hope one day you will have one. Thanks so much for your beautiful and interesting post!